In home sessions are super underrated, mostly because a lot of people assume you need a Pinterest worthy home before you book one. Which couldn’t be further from the truth! I don’t arrive to an in-home session, prepared to photograph your home and it’s decor. In home sessions are special because they bring out a family’s true connection and personality. Being at home allows everyone to relax, be themselves, and act silly which creates those natural, unforced moments. My first tip is to embrace the craziness. Don’t try to overplan, or stress too much about the kids cooperating. These sessions are typically the best when we let the kids take the lead. If they feel free and excited, it shows through in the photos. 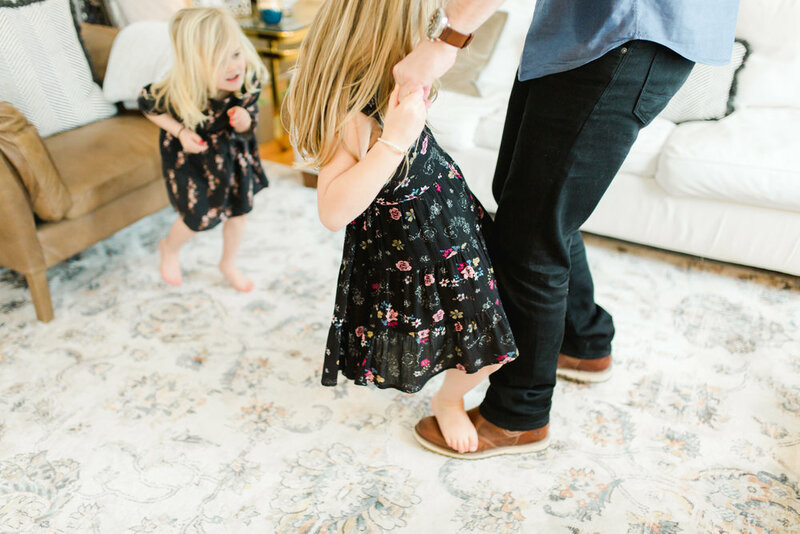 We want to encourage all of those playful, sweet moments and not make them feel like they need to stand there and smile at the camera. Light is important! I’ll ask you to pay attention to which part of the day your house is brightest, or gets the prettiest light. Don’t stress if your home is on the darker side! As long as there’s some windows, there will always be pockets of light to shoot in. Hype the kids up! Let them know how exciting our upcoming session will be. I’ve learned that kids do so much better at sessions when parents talk to them about it beforehand. Ask them to pick their favorite family activity to incorporate into the session. Whether it be bath time, making breakfast, building a fort, etc. Allowing them to have a say in the session makes it so fun! My last piece of advice is just to relax, and love on your family. Your home is where you create all of these amazing everyday memories together, and an in-home session gives you the opportunity to have those special moments captured. So play, snuggle, laugh, and let your family’s love for each other shine through. You’ll never regret having the little in-between moments preserved forever. And there we have it! My top tips for a successful in home session. Feel free to email or comment below with any questions you may have! If you’re interested in booking a session, click the Contact tab and send me an email so we can chat! !